Since their discovery by Ilye Metchinkoff in the early 20th century, probiotics have emerged as a fascinating area, health-related and commercial target, especially in the past two decades. World Health Organization in 2001 defined probiotics as live microorganisms which when administered in adequate amounts confer health benefits on the host. Probiotics are recognized to perform several actions in the gastrointestinal tract. In relation to prevention of oral diseases, probiotics are administered to maintain and restore the natural saprophytic microflora against pathogen invasion, which is central to the development of major oral diseases. Many strains of probiotics used to obtain gastrointestinal benefits may not be ideal for the oral environment, which is quite different from the intestinal habitat. Commonly, most of the organisms ascribed as having probiotic properties belongs to the genera Lactobacillus and Bifidobacterium. Most commonly used vehicle for delivery of probiotics has been dairy products, milk, being the most commonly used vehicle. Other vehicles used to confer oral health benefits include spray-dried milk powders, ice-cream, yogurt, cheese, lozenges, tablets, powders, and slow-release pacifiers. They had several drawbacks such as short shelf-life, irregular consumption, and limited availability. One of the pioneer studies on probiotics in oral care was done by Näse et al., in 2001, where the antimicrobial action of Lactobacillus rhamnosus containing milk against Streptococcus mutans (MS) was found to be statistically significant. In the current study, a commercially available probiotic toothpaste, PerioBiotic (Spearmint flavored) from the company Designs for Health, has been tested. The toothpaste contains the strain Lactobacillus paracasei, which has been found to co-aggregate with MS. L. paracasei is one of the lactobacillus species with maximum interference activity against MS in vitro. Most of the previous studies were done using the microbial plating method or else chair-side method. These methods have been used for many decades and constitute the conventional method of antimicrobial analysis but are not very accurate or reproducible. The Plaque Glycolysis and Regrowth Method (PGRM) was used for the evaluation of the antimicrobial effects on plaque metabolism in vivo. PGRM is based on the observation that natural fasted dental plaque, sampled from different quadrants of the dentition, exhibits similar metabolic and regrowth properties when suspended at equal “biomass” in standardized media. The aim of the study was to analyze the extent of plaque regrowth upon the usage of a probiotic toothpaste containing L. paracasei by measuring the optical density using a spectrophotometer. The study protocol was approved by the Ethical Committee at JSS. Dental College and Hospital, Mysore (Batch number: 7931-1-2015). Informed consent from the participants' parents and assent from the participants were obtained before the commencement of the study. This being a pilot study; five healthy participants aged 10–12 years were recruited for the study from the children who reported at the Outpatient Department (OPD) at the Department of Paediatric and Preventive Dentistry, JSS. Dental college and Hospital, Mysore, based on the inclusion and exclusion criteria. The inclusion criteria were healthy caries-free children without any prescribed medication. The exclusion criteria were children with medical complications, children with dental and/or gingival problems, children with learning disabilities, those under medication, and those under antibiotic therapy either at the time of the study or up to 3 months before the start of the study. The study had two main sections: an in vivo aspect, where the effect of the probiotic toothpaste on the oral biofilm was analyzed 15, 45, and 90 min after use, and an ex vivo aspect, where the plaque regrowth upon exposure to a strong sucrose challenge (40%) was studied. The protocol was first proposed by White et al. in 1995. The stock solutions of 6% and 0.03% Trypticase Soy Broth (TSB), distilled water, and 40% sucrose solutions were prepared the day before the study and autoclaved. The participants were on a washout toothpaste regimen for a period of 1 week before the commencement of the study. The participants were asked to fast overnight for 12 h before the start of study as well as refrain from eating or drinking throughout the study. On the day of the study, the participants were asked to report without brushing. The Probiotic toothpaste (PerioBiotic - Designs for Health, Batch number 7931;01-2015) was provided for their use on that day. All the autoclaved Eppendorf tubes to be used were placed in the mini-cooler at −20°. Baseline prebrushing pooled plaque was collected from buccal and palatal tooth surfaces of maxillary left quadrant at 0 min. Exactly 0.75 g of probiotic toothpaste was weighed using a microbalance and dispensed onto a kids toothbrush (Pepsodent Kids). The participants were then asked to use the test toothpaste and brush the buccal, palatal, and occlusal aspects of the teeth of the maxillary left quadrant alone for 30 s, followed by 30 s of swishing the toothpaste slurry around the mouth and then using 10 mL of distilled water to rinse for 10 s before spitting it out. Time was noted at the end of brushing. This was followed by postbrushing pooled plaque sample collection at 15, 45, and 90 min after brushing from the mandibular left, mandibular right, and maxillary right quadrants, respectively. Plaque dispersion was done in 1.75 mL of 0.03% TSB at pH 7.1 by vortexing for 3 min. All the dispersed plaque samples were placed back in the mini cooler. The control and test solutions were individually pipetted out and transferred to optical cuvettes. Initial OD is noted using a spectrophotometer at 600 nm. Biomass was standardized to 0.2 OD by adding the required amount of 0.03% TSB. Thus, the biomass was standardized. Plaque regrowth analysis was done by taking 300 mL of the biomass standardized dispersed plaque solution in a 2 mL Eppendorf vial with 0.5 mL of 6% TSB (pH = 7.1 ± 0.2), adding 50 mL 40% sucrose solution, and 100 mL sterile water followed by incubating at 37° in incubator shaker at 300 rpm for 4 h. All the plaque test samples had controls which contained all the ingredients as the test sample except the presence of plaque. Thus, in the control samples, instead of 300 mL of dispersed plaque, 300 microliters of 0.03% TSB was added and the test was conducted. OD was noted for each sample at 15 min, 45 min, 90 min, and 4 h, respectively, using a spectrophotometer. This being a pilot study, only five children participated in the study. All the children were from the OPD at the Department of Paediatrics and Preventive Dentistry at JSS Dental College and Hospital, Mysore. The mean age of the children was 10.2 years. All the children were healthy and without any dental problems. The baseline biofilm analysis, i.e., the analysis of all the 0 min (prebrushing) samples from all the children showed no significant difference when analyzed by one-way ANOVA indicating that the baseline values were balanced. When the final 4 h biofilm regrowth of the postbrushing samples was analyzed using One-way ANOVA, the probiotic toothpaste was seen to have significantly reduced bacterial growth. When individual samples were analyzed, the 0 min (baseline/control) samples showed a linear growth from 15 min to 4 h which was far greater in percentage than the 15 min postbrushing and 45 min postbrushing sample growth [Table 1]. The linear growth from 15 minutes to 4 h of the 15 min postbrushing samples showed far lesser growth than the before brushing sample and displayed the highest reduction in bacterial growth. The 45 min postbrushing samples revealed a linear growth which was far lesser in percentage than the 0 min sample growth but >15 min sample growth. The growth seen in the 90 min postbrushing samples was greater in percentile than other samples. There was a statistically significant reduction in the plaque regrowth rate of the postbrushing samples [Table 2]. 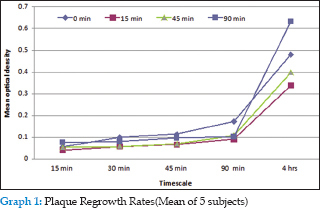 The mean growth rates before and after brushing are portrayed in [Graph 1]. Probiotic therapy has always been considered with respect to gastrointestinal conditions. In recent years, its application as an oral care product has been studied and is slowly gaining popularity. Most studies are done using dairy products containing probiotic strains. Most commonly used strain was Lactobacillus rhamnosus, Lactobacillus reuteri, and Bifidobacterium sp. There was a need for a vehicle for the probiotic strain that was stable, had a relatively long shelf life, and could be made available and usable by a larger section of the society on a regular basis. The company, Designs for Health, used the patented Dental-Lac composition and introduced a probiotic toothpaste, PerioBiotic (containing L. paracasei) in the year 2003. The present study was an attempt to analyze the effectiveness of this probitoic toothpaste containing L. paracasei in reducing the MS monospecies biofilm in vitro using a spectrophotometer. L. paracasei has been previously studied by a number of authors. Meurman 1995, Nase, 2001, Aloha, 2002, and Caglar, 2006 and 2008 have all demonstrated the potential of L. paracasei interfering with the growth of MS. Cildir et al., 2009, showed that L. paracasei was effective when used by orthodontic patients. Zhu, 2000, Aloha, 2002, Masteromarino, 2002, Lazo, 2004, and Busarcevic, 2008 state that apart from acidogenicity, production of antimicrobial factors such as hydrogen peroxide and bacteriocins are responsible for the activity by probiotics. Parvez in 2006 summarized that competitive inhibition was one of the mechanisms of action of the Lactobacillus sp. Lang et al. investigated the specific co-aggregation between L. paracasei DSMZ 16671 and oral streptococci and concluded that the event was heat-stable and protease resistant and not affected by pH between 4.0 and 8.0. In another study conducted by the same author on carious lesions induced in rats, it is stated that L. paracasei DSMZ 16671, even if heat-killed, sensitively co-aggregates with MS. Chuang et al., in 2011, stated that a 2-week period of medication at least may be needed for L. paracasei GMNL-33 through oral administration to become effective in the probiotic action. Simark-Matterson et al. conducted a study on the Lactobacillus-mediated interference of MS and concluded that, among the different Lactobacillus sp., L. paracasei showed the most effective inhibition of MS. A systemic review on the use of probiotic strains in caries prevention compiled in 2013 summarized that the several local and systemic effects of probiotics are attributed to the adhesion, co-aggregation, competitive inhibition, production of organic acid and bacteriocin-like substances, and immune-modulation. They concluded by stating that the use of probiotics for caries prevention shows promising results even if only a few studies have demonstrated clear clinical outcomes, and for all products effective in caries prevention (i.e., fluoride and chlorhexidine), a frequent intake is required, so a possible way of administration could be to insert probiotic in other daily preventive products such as toothpaste. Thus, in the current study, a commercially available probiotic toothpaste, PerioBiotic - Designs for Health, was used and a single-usage pilot study was carried out. Furthermore, the methodology followed, though not a recent concept, was found to be rarely used for the analysis of action of a probiotic product against oral microorganisms. The PGRM methodology was first introduced in 1995 by White et al. In the current study, the plaque collection methodology has been slightly altered to suit the needs of the study. This methodology primarily relies on the experimental observation that natural fasted dental plaque, sampled from different quadrants of the dentition, exhibits similar metabolic and regrowth properties when suspended at equal “biomass” in standardized media. This technique combines the necessary biological factors important to legitimate evaluation of antimicrobial effects, in vivo, while benefiting from the improved precision and control provided by in vitro assessment of plaque activity. This method is more accurate and less cumbersome than the traditional plate culturing method of bacterial growth. Furthermore, the metabolic by-products are actually associated with disease occurrence and severity rather than the bacterial numbers and plaque levels per se. To further emphasize on this statement, a strong sucrose challenge was posed in the ex vivo aspect of the current study that determined the extent of plaque regrowth. In the study by White et al., the collected plaque was assessed at the baseline and then directly at the end of 4 h. No assessment was done at 15, 30, 45, and 90 min before the 4 h reading. This being an in vitro study, the buffering capacity of the saliva in the normal mouth on exposure to the sucrose challenge could not be taken into account. Further in vivo studies are required to study the exact process occurring clinically. The very high concentration of sucrose solution (40%) used in the study can be justified as it permits us to reduce the duration of the study at the same time allowing us to extrapolate the results to the normal sugar consumption levels. On an average, a person consumes 4 g (2 teaspoons) of sugar with the regular beverage. Thus, in this study, 10 times the normal concentration of sugar exposure at any given point of time was added. The results of the present study suggest that the probiotic toothpaste is effective in reducing the MS growth up to 45 min after brushing when immediately exposed to 40% sucrose load. Somewhere between 45 and 90 min after brushing, the effect of the probiotic product reduces. In conclusion, the results suggest that the L. paracasei- based toothpaste, PerioBiotic, is effective in the reduction of the MS monospecies biofilm but the activity appears short lived when high sucrose exposure is administered. Further studies need to be carried out using larger sample size and to evaluate the long-term efficacy of the product. Stomatova I, Meurman J.H. Probiotics:Health benefits in the Mouth. Am J Dent 2009; 22:329-338. White DJ, Cox ER, Liang N, Macksood D, Bacca L. A new Plaque Glycolysis and Regrowth Method (PGRM) for the in vivo determination of antimicrobial dentifrice/rinse efficacy towards the inhibition of plaque growth and metabolism – Method development, validation and initial activity screens. J Clin Dent 1995;6:59-70. Teanpaisan R, Piwat S. Lactobacillus paracasei SD1, a novel probiotic, reduces mutans streptococci in human volunteers A randomized placebo-controlled trial. Clin Oral Investig 2014;18:857-62. Näse L, Hatakka K, Savilahti E, Saxelin M, Pönkä A, Poussa T, et al. Effect of long-term consumption of a probiotic bacterium, Lactobacillus rhamnosus GG, in milk on dental caries and caries risk in children. Caries Res 2001;35:412-20. Simark-Mattsson C, Emilson CG, Håkansson EG, Jacobsson C, Roos K, Holm S. Lactobacillus-mediated interference of mutans streptococci in caries-free vs. caries-active subjects. Eur J Oral Sci 2007;115:308-14. Twetman S, Stecksén-Blicks C. Probiotics and oral health effects in children. Int J Paediatr Dent 2008;18:3-10. Keller MK, Hasslöf P, Stecksén-Blicks C, Twetman S. Co-aggregation and growth inhibition of probiotic lactobacilli and clinical isolates of mutans streptococci: An in vitro study. Acta Odontol Scand 2011;69:263-8. Ritthagol W, Saetang C, Teanpaisan R. Effect of Probiotics Containing Lactobacillus paracasei SD1 on salivary mutans streptococci and lactobacilli in orthodontic cleft patients: A double-blinded, randomized, placebo-controlled study. Cleft Palate Craniofac J 2014;51:257-63. Lang C, Böttner M, Holz C, Veen M, Ryser M, Reindl A, et al. Specific Lactobacillus/Mutans Streptococcus co-aggregation. J Dent Res 2010;89:175-9. Tanzer JM, Thompson A, Lang C, Cooper B, Hareng L, Gamer A, et al. Caries inhibition by and safety of Lactobacillus paracasei DSMZ16671. J Dent Res 2010;89:921-6. Chuang LC, Huang CS, Ou-Yang LW, Lin SY. Probiotic Lactobacillus paracasei effect on cariogenic bacterial flora. Clin Oral Investig 2011;15:471-6. Cagetti MG, Mastroberardino S, Milia E, Cocco F, Lingström P, Campus G. The use of probiotic strains in caries prevention: A systematic review. Nutrients 2013;5:2530-50.